We’d love your help. Let us know what’s wrong with this preview of Parenting the Hurt Child by Gregory C. Keck. When a child is adopted, he or she can arrive with hurts from past pain. With time, patience, informed parenting, and appropriate therapy, your adopted child can heal, grow, and develop beyond what seems possible now. Gregory C. Keck and Regina M. Kupecky explain how to manage a hurting child with loving wisdom and resolve and how to preserve your stability while untangling their thorny hearts. • Indexed for easy reference. To ask other readers questions about Parenting the Hurt Child , please sign up. The author actually suggests that parents mock their hurting child's tantrums and dare them to "do better". Ah, I know exactly how that would go over in my home, and it would not be pretty, and CERTAINLY not healing, for my child. What a ridiculously counterproductive and escalating choice, and the very antithesis of building attachment and trust with a hurting child. The "culture" the author claims children come from (p.168) is actually a list of things that result from poverty and broken child welfare systems, not a first family's "culture". Belittling and vilifying a first family does nothing to grow trust with a child that has a natural bond with that family. Not all adoptions are the result of abuse and neglect, and many adoptees with loving first families (who felt compelled through circumstances of poverty and lacking social support systems) still suffer from the trauma of adoption. The author doesn't seem to understand this. -Parents do not need to have a consequence for a child’s every misdeed. -Family fun should not be contingent on child behavior. -Expectations are more effective and powerful than lots of rules. -Parents must decide what information is private about the child. -Hurt children get better when their pain is soothed, their anger reduced, their fears quelled, and their environment contained. CH1: Who is the hurt child? -Hurt children are sensitive their own vulnerability and perceived weakness. They act terrified of losing control and fearful of control by others. -They have survivor’s mentality and deny their vulnerability (think nothing can hurt them). -Healthy fear eventually leads to respect, empathy and love, and a child cannot arrive at one stage without going through the prior stages. -Being cooperative , compliant, and receptive translates to losing. -For healthy children, control over them equates to love. They believe their parents are all-powerful and it’s okay for them to be vulnerable. They can be weak without being unsafe, and this helps them develop a conscience (internalize morals based on fear of disapproval). -Nurturing vs. rewards – Nurturing happens whether or not the child behaves well; rewards are more like bribery to achieve a particular behavior. Children should not be reward for doing what they are expected to do. -Should never withhold affection/love towards the hurt child. It is impossible to make them feel worse than they already have been made to feel. -Hurt need time-ins with parents instead of time-outs. Instead of grounding, it is better to require permission for everything so there are no assumptions about what is okay to do. -Deprivation: Taking things way from hurt children (who are used to losing everything) is ineffective. Instead, if something is going to be taken away, it needs to be taken away forever so they learn to believe what you say. For example, if they continually fail to take care of a toy/s, you can let them know that you are going to give them to a child who doesn’t have any of those toys (and make the child’s life easier because it will be less for them to clean up and take care of). -Anger: Must remember that anger is a hurt child’s best friend. In fact, they are often the most unhappy when parents are joyful. Anger helps them feel safe and distant, and when he sees it in others, he feels powerful. It brings the level of energy the child is accustomed to. -Authors argue that the most effective ways to achieve attachment is through touch, smell, speech, motion, warmth, and eye contact. -Best not to tell hurt child consequences of their behaviors, instead, parents should alternate responses so the child is always guessing as to what you will do. -Negative behaviors: turn all negative behaviors into something that you control (act like it is what you wanted them to do anyway). E.g., rating a tantrum, ask them to scream louder, predict their negative behavior. -Enhancing communication – tell adoption story over and over, past experiences with kids, etc. -Teach children phrases to help them survive in school and practice them: e.g., I need help, I can do difficult things, I always have a choice, I can learn from my mistakes, I like to try new things, I like school, I can solve this, I know I can count on myself, I know where to get help, I can solve problems, I need your help to understand. First off: I am not a parent. I'm an adult adoptee. I read a lot of adoption books, including this one, in order to gain a fuller understanding of myself and my relationships with my family. Not that this would normally matter, but I'm also an atheist. I'm not an angry, pushy atheist, but I'm not interested in having others' faith pushed on me. I wasn't aware that this was a book by born-again Christian authors, printed by a Christian publisher, until the non-sequitur screed about abortion and c First off: I am not a parent. I'm an adult adoptee. I read a lot of adoption books, including this one, in order to gain a fuller understanding of myself and my relationships with my family. Not that this would normally matter, but I'm also an atheist. I'm not an angry, pushy atheist, but I'm not interested in having others' faith pushed on me. I wasn't aware that this was a book by born-again Christian authors, printed by a Christian publisher, until the non-sequitur screed about abortion and contraception on page 39. The Christian slant wasn't overpowering, but it was definitely present. This is not what I signed up for! I also didn't sign up for a commercial for Foster Cline's "Parenting with Love and Logic" products, which were mentioned many, many times in this book. One mention would have been okay, but this was overkill. There was a lot of interesting and helpful information in this book, and I'm glad I read it, but there were also a lot of things I couldn't get behind. Once again, I'm not a parent, so I'll freely admit that I can't completely understand, but I winced at statements like "healthy children also develop a level of fear [of their parents]" (p. 42), and "It is not necessary to be consistent with hurt children." (p. 67) I also don't believe that the authors' close ties to Foster Cline, whose therapy techniques are controversial, does them any favors. As an adoptive parent, I found this book to be an outstanding and extremely empathetic look at the struggles faced by adoptive parents and their children. The authors did an excellent job providing suggestions for things you can do to help your child, while also providing lots of suggestions and encouragement for parents. It's easy to read and filled with great ideas. While many similar books focus on how parents can help their children form attachments, heal from past trauma, etc., this book als As an adoptive parent, I found this book to be an outstanding and extremely empathetic look at the struggles faced by adoptive parents and their children. The authors did an excellent job providing suggestions for things you can do to help your child, while also providing lots of suggestions and encouragement for parents. It's easy to read and filled with great ideas. 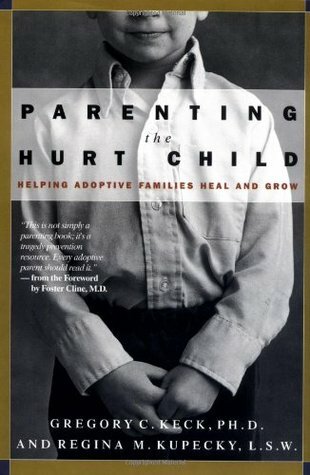 While many similar books focus on how parents can help their children form attachments, heal from past trauma, etc., this book also conveyed deep levels of empathy for adoptive parents and lots of suggestions for parents who are struggling to connect with their "hurt" children. Although I liked some of what the authors say in this book in terms of spending quality time with children, I can also see how their attitude toward control over the child leads to a lack of respect for children and a failure to listen to their needs. Not my favorite book, but I can see coming to it as a last resort for extremely behaviorally challenged kids. If I were to rate only the first half of the book, I would give probably 4 or 5 stars. But I was so disappointed with the last half of the book that I can only give it 2 stars. The first half of the book (relating to discipline, etc.) was really helpful. But after that, it felt almost as if the authors said "ok, we don't feel like writing any new material anymore.... Let's just write the bare minimum and then say 'for more information, you should really read Parenting With Love And Logic.'" It g If I were to rate only the first half of the book, I would give probably 4 or 5 stars. But I was so disappointed with the last half of the book that I can only give it 2 stars. The first half of the book (relating to discipline, etc.) was really helpful. But after that, it felt almost as if the authors said "ok, we don't feel like writing any new material anymore.... Let's just write the bare minimum and then say 'for more information, you should really read Parenting With Love And Logic.'" It got to the point where I almost wished I hadn't started this book and just read Parenting With Love And Logic instead. The last half of the book consists of responses from adoptees and adoptive parents; some of it was really helpful, but even some of their statements (parents' statements - not the adoptees) seemed like shameless promotion of the authors - both their books and services as therapists - and other books out there in the adoption world. I really, really enjoyed the perspectives of the adoptees! Of all the books I've read about adoption, this one is by far the best. If you are thinking about adopting a child or have already done so, or if you work with adoptive families in any way, you need to read this book. During our long training sessions in preparation to complete a special-needs adoption, social workers recommended this particular book over and over again. I started to wonder what all the fuss was about, so I did a quick search on the library website, and found there was only one copy floating around. Yikes! I requested it right away. It wasn't far into the book before I understood what was going on. Ah, I see. Our course of learning how to parent special needs kids? Yeah, it almost felt lifted During our long training sessions in preparation to complete a special-needs adoption, social workers recommended this particular book over and over again. I started to wonder what all the fuss was about, so I did a quick search on the library website, and found there was only one copy floating around. Yikes! I requested it right away. That's not a criticism of either the book or the class, it just notes that everything that the social workers thought we needed to learn about parenting kids with issues was covered in this book, only to a far more in-depth degree than could possibly be covered in a class full of people asking questions. This book is written more for parents who are already parenting these children and facing issues from the abuse, neglect, and other circumstances the kids have endured in the past, and so is chock-full of helpful suggestions for activities and conversations, ways to work around traditional parenting advice that can be awful for these kids, and ways to wrap your head around techniques that may seem counterintuitive to even the most willing parent. There are pages and pages I needed to xerox so I could be sure to have them on hand in the future, and additional pages and pages in the back of further resources that I would have copied... but discovered they were already a part of our big parenting handbook from the province. If you are dealing with common issues such as attachment problems, lying, or control issues which crop up in many adopted kids, there are lots of coping strategies and advice to keep you from pulling your hair out. The book also touches on some of the more extreme cases, and gives great, real-world accounts written by both parents and kids who have been there of the real life techniques they used to make it through the hard times. If you are still preparing to bring your kids home, as we are, this book is a way to get a great leg-up on knowing more details of things you can expect, so that you are already prepared when the stormclouds blow in. Kind of like stocking up your storm shelter for tornado season, but putting those supplies in your emotional bank instead. Really disappointed with this one. So much of the book seemed like filler (chapters made entirely of stories from parents and children, while interesting, would be better woven into the book at meaningful times, rather than just a hodgepodge of other peoples' narratives), and the rest of it seemed like a huge ad for reading "Parenting with Love and Logic." Which I am probably not going to do, because this was the book I checked out of the library, not that one, and I would appreciate if it actua Really disappointed with this one. So much of the book seemed like filler (chapters made entirely of stories from parents and children, while interesting, would be better woven into the book at meaningful times, rather than just a hodgepodge of other peoples' narratives), and the rest of it seemed like a huge ad for reading "Parenting with Love and Logic." Which I am probably not going to do, because this was the book I checked out of the library, not that one, and I would appreciate if it actually had content beyond "Go and read this other book that we wrote." I also was unaware that this was a Christian publisher before I checked out the book. Before someone gets offended by that, let me clarify that I am a Christian and wasn't exactly SURPRISED since I had seen the book recommended on the blogs of other Christians. The publisher made me wary just because I have my own set of issues with Christian publishers and I know how disappointing their books can be. The high praise I read about this book made me hope that my fears were unfounded. Unfortunately, that didn't completely seem to be the case. There are some deep underlying beliefs here that I think differ from mine quite a bit and led to the author's viewpoint not sitting right with me in a few places. In particular, there were occasionally glimpses of an extremely negative viewpoint towards any "outside" parenting advice and an overemphasis on control of the parents. It skirted the line of judgmental often, and at times there were very explicit efforts made for the authors to clarify: I am not saying this. I can appreciate clarification but it seems like it would have been easier for the authors to not run the risk of being misinterpreted by being more clear originally. Misinterpretation is never completely avoidable, but more effort could have been made here. I began skimming the book after a few overbearing comments about control and a completely useless and irrelevant paragraph about abortion - it was way out of left field, and I'm pro life myself. It had nothing to do with the chapter and was completely inappropriate and distracting. At that point, I wondered if the author was trying too hard to convey his own politics and beliefs under the veil of parenting advice. After reading Deborah Gray's Nurturing Adoptions, Keck & Kopecky come out with a bang! This is a straight-shooting pair who does not mince words in their frustration with psychologists. Keck & Kopecky also have a unique perspective in expressing consistent support of and respect for the parents that enter into what they know will be challenging adoptions. Rather than dwell on their limitations as necessitating assistance, Keck and Kopecky point out that these parents were functioning wel After reading Deborah Gray's Nurturing Adoptions, Keck & Kopecky come out with a bang! This is a straight-shooting pair who does not mince words in their frustration with psychologists. Keck & Kopecky also have a unique perspective in expressing consistent support of and respect for the parents that enter into what they know will be challenging adoptions. Rather than dwell on their limitations as necessitating assistance, Keck and Kopecky point out that these parents were functioning well before they adopted. They seek to encourage and strengthen parents as the pivotal day in day out support for hurt children. This book is also extremely practical for parents in the trenches. Short chapters includes idea lists for practical implementation of suggested strategies with disclaimers for parents to discover and utilize the strategies that work for them and their specific children. I am looking forward to revisiting this book after our placement for ideas in how to address the specific concerns we encounter. The more I write about this book, and trudge through long bombastic works by others, the more I value the contribution Keck & Kopecky have made! Highly recommended. If giving 1/2 stars was possible, this would receive 3 1/2 stars instead of 4. The first part of the book was excellent, providing much insight to behavior, feelings, emotions, thoughts of the hurt child. It certainly opened my eyes. However, it would have been helpful to have more practical advice on how to deal with the child, rather than as many examples and stories. As a grandmother of a "hurt" child, I learned some useful techniques, but wish there had been more. 5. Nurturing the Hurt Child: LISTS OF ACTIVITIES! This is one of those Yes! Yes! Yes! books. I wish everyone who has adopted or loves a family who has adopted would read this book. I'm only a few chapters in, but it is resounding solidly with me. Just finished this book. The ending of this book is perfect, and I think you can tell a lot about a book by how it begins and ends. For those who have been personally involved in adoption, either by being the birth parent, adoptee, or adoptive parent - this book is FOR you. And for everyone else, you wi This is one of those Yes! Yes! Yes! books. I wish everyone who has adopted or loves a family who has adopted would read this book. I'm only a few chapters in, but it is resounding solidly with me. A valuable resource for adoptive parents. I am so glad I read this book. Its tone is realistic but not depressing, so I believe parents would feel empowered by the information, not discouraged by it. The significant trauma some children may have faced in their pasts and the ways that trauma manifests itself in their new adoptive families is addressed. Specific strategies, suggestions, and stories of real families are included. A book to revisit throughout the parenting journey. The book often cro A valuable resource for adoptive parents. I am so glad I read this book. Its tone is realistic but not depressing, so I believe parents would feel empowered by the information, not discouraged by it. The significant trauma some children may have faced in their pasts and the ways that trauma manifests itself in their new adoptive families is addressed. Specific strategies, suggestions, and stories of real families are included. A book to revisit throughout the parenting journey. Awesome parenting tips for my family and lots for anyone's family. They give pages of real and easy ideas on how to increase love and trust between you and your children and between siblings. There are fun ideas like becoming sticker sisters (you both wear a matching sticker all day but it's your little secret) or hiding chocolate kisses around the house for when they come home from school but before they can eat them they have to hug and kiss you OR each other for each one they want to eat. Lots Awesome parenting tips for my family and lots for anyone's family. They give pages of real and easy ideas on how to increase love and trust between you and your children and between siblings. There are fun ideas like becoming sticker sisters (you both wear a matching sticker all day but it's your little secret) or hiding chocolate kisses around the house for when they come home from school but before they can eat them they have to hug and kiss you OR each other for each one they want to eat. Definitely the best book I've read on what happens after adoption. The book tackles how to foster attachment and addresses various issues that adopted children can face. It offers practical advice and suggestions on what to do if the parent and child need more help than a book can provide. I truly hope I won't need this book when my daughter comes home but we may face some of these issues. If so, I have a good resource to turn to. I thought this book had some gems, with some sections that were really great in teaching empathy and understanding of the unique issues that children who may have traumatic histories are experiencing. But other parts were more frustrating, and the book as a whole was not that intriguing. Very much a parenting book in some ways. So far, I have learned more from reading memoirs which connect to me on a deeper level, but this may work for some parents. I was directed to this book by our counselor and was so thankful to have read it. It really spoke to the issues we have been going through with our daughter, who is adopted from China. This is a great read to examine your approaches and responses, and help give an understanding into your child's complex and deeply ingrained fears and struggles. Highly recommend this to the adoptive parent working on bonding or attachment concerns. I really wish I had known about this book when we first began our journey of foster care and adoption 2 years ago. This book has helped me immensely, especially chapter 5: Cinnamon on Applesauce, Nurturing the Hurt Child. What a great read and one I will often refer back to. This book was actually depressing at the start. I wasn't sure I wanted to read the whole thing, but I am glad I kept with it. Keck & Kupecki offer solid advice that feel matches the personalities of my husband and me. While this book presents worst case scenarios, it also left me feeling hopeful about dealing with whatever potential issues my future adopted child would have. Really informative book with lots of info on parenting adopted kids with painful pasts. It's hard to swallow sometimes though because it basically tells that you have to parent opposite of the way I would generally naturally parent.. No time outs, time ins instead... Taking away privileges isn't necessarily do any good.. Stuff like that. Great book though! Although this book is specifically written for parents adopting children older than infancy, I consider it a must read for any parent that has a defiant child. It helps parents get inside the kid's head and get creative about ways of connecting with their child and maintaining a relationship with them, despite how negative their behavior may be. I'm currently reading this book as preparation for an extension of our adoption paperwork. I can't recommend it highly enough. It's full of practical information and explained in a very readable manner using loads of examples. This book doesn't just tell you about different approaches, it shows you exactly how to use them. I can see this being a very valuable resource for the future. An important book for everyone involved in child welfare, adoption, fostering and on and on. This book gave me (a volunteer) great ideas on how to help children who have suffered loss without "pretending to be a psychologist". This was a great book with well illustrated examples on parenting a child who has suffered neglect and abuse. I would recommend for any person or couple interested in learning more about providing foster care or adopting (domestically or internationally). Encouraging and informative, this book gives readers practical advice for creating bonds with their adopted children and for coming up with out-of-the-box solutions to the unique problems stemming from attachment issues and early trauma.